Pomacea paludosa (Say, 1829), the Florida applesnail, occurs throughout peninsular Florida (Thompson 1984). Based on fossil finds, it is a native snail that has existed in Florida since the Pliocene. It is also native to Cuba and Hispaniola (FFWCC 2006). Collections have been made in Alabama, Georgia, Hawaii, Louisiana, Oklahoma and South Carolina (USGS 2006). It is the principal food of the Everglades kite, Rostrhamus sociabilis plumbeus Ridgway, and should be considered beneficial. It cannot survive low winter temperatures that occur in the northern tier of Florida counties and northward except where the water is artificially heated by industrial wastewater or in warm springs. It occurs as far west as the Choctawhatchee River. 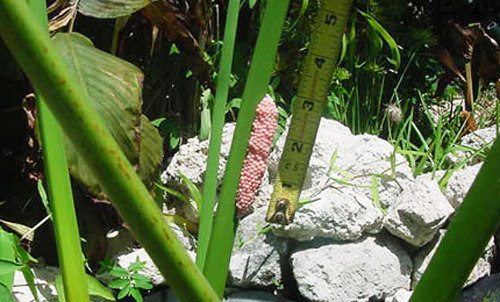 It is easily distinguished from other applesnails in Florida by the low, strongly rounded shell spike, and measures about 40–70 mm (Capinera and White 2011). Figure 1. Florida applesnail, Pomacea paludosa (Say, 1829). Photograph by Bill Frank, http://www.jacksonvilleshells.org. 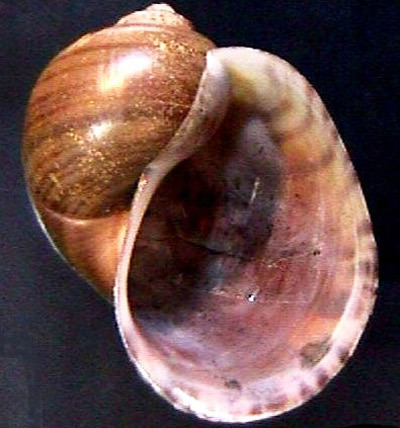 Pomacea maculata (Perry, 1810), the island applesnail, is the most common introduced species. This species was originally thought to be the channeled applesnail. 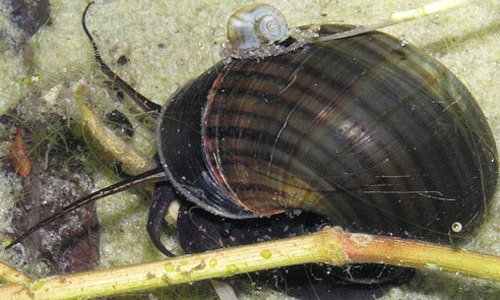 Pomacea maculata was probably released in southern Florida in the early 1980s by persons with the tropical pet industry, and rapidly expanded throughout the state. Pomacea maculata is now found in Alabama, Georgia, Hawaii, Louisiana, North Carolina, South Carolina and Texas. Introductions have occurred in Arizona, California and Hawaii. (FFWCC 2006, USGS 2009b). Figure 2. Adult island applesnail, Pomacea maculata (Perry, 1810). Photograph by Bill Frank, http://www.jacksonvilleshells.org. Figure 3. Egg cluster of an applesnail, Pomacea sp., photographed in Gainesville, Florida. Eggs are probably those of the island applesnail, Pomacea maculata (Perry, 1810). Photograph by Barbara Claiborne. Figure 4. Spike-topped applesnail, Pomacea diffusa Blume, 1957. Photograph by Bill Frank, http://www.jacksonvilleshells.org. Figure 5. Egg mass of the spike-topped applesnail, Pomacea diffusa Blume, 1957. Photograph by Bill Frank, http://www.jacksonvilleshells.org. 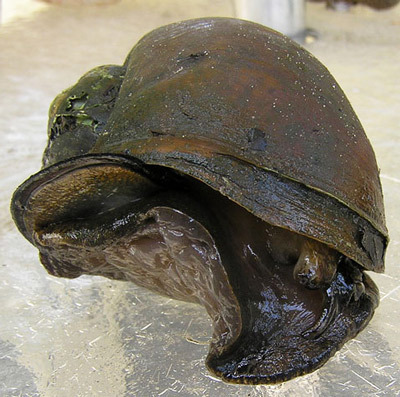 Pomacea haustrum (Reeve, 1856), the titan applesnail, is rare and is found only in southeastern Florida (FFWCC 2006, USGS 2007). This species lays green egg masses. Figure 6. Shell of the titan applesnail, Pomacea haustrum (Reeve, 1856). Photograph by Luis Ruiz Berti. Figure 7. 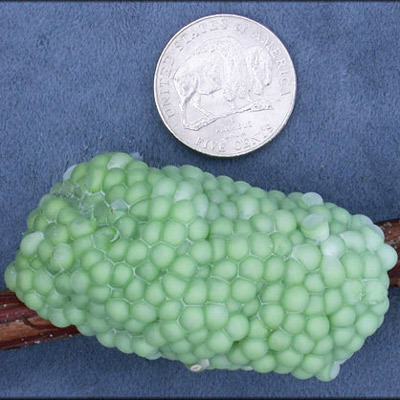 Egg mass of the titan applesnail, Pomacea haustrum (Reeve, 1856). Photograph by Bill Frank, http://www.jacksonvilleshells.org. Figure 8. Florida applesnails, Pomacea paludosa (Say, 1829). Notice the operculum almost sealing the entrance to the shell in the topmost snail. Photograph by Bill Frank, http://www.jacksonvilleshells.org. 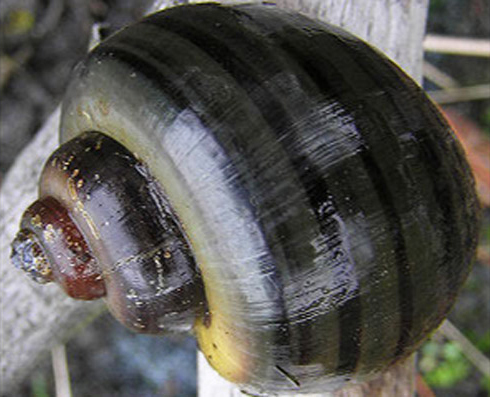 However, it is the channeled applesnail, Pomacea canaliculata (Lamarck, 1828), that causes concern to farmers. 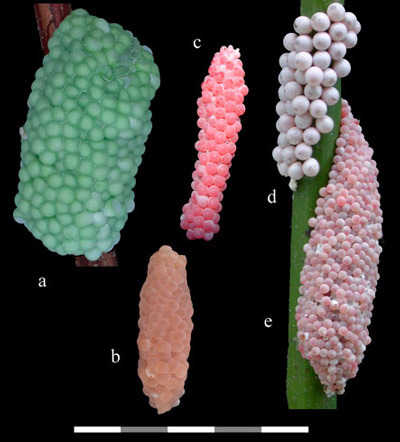 The channeled applesnail has caused significant damage to rice and taro crops in the Pacific islands and in southeastern Asia. Fortunately, this species has not been documented from Florida. It has been reported from California and Hawaii (USGS 2010). Although, the USGS map (2010) shows it in northeastern Florida, recent molecular data proved that this population was not Pomacea canaliculata (Capinera and White 2011). Figure 9. Channeled applesnail, Pomacea canaliculata (Lamarck, 1819). Photograph by Jeffrey Lotz, DPI. Figure 10. 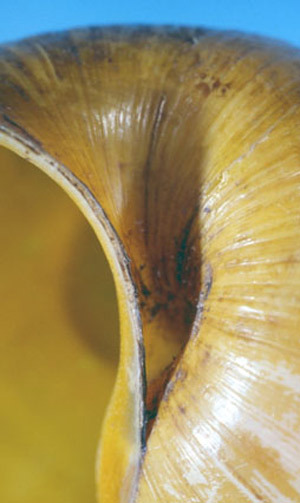 Channeled applesnail, Pomacea canaliculata (Lamarck, 1819), showing the deep groove or channel giving it its name. Photograph by Jeffrey Lotz, DPI. Figure 11. Egg masses of introduced and native Pomacea spp. in the continental U.S. a) Pomacea haustrum, titan applesnail; b) Pomacea diffusa, spike-topped applesnail; c) Pomacea canaliculata, channeled applesnail; d) Pomacea paludosa, Florida applesnail; e) Pomacea maculata, island applesnail. Scale bar = 5 cm. Photograph by Rawlings et al. Effective 5 April 2006, USDA-APHIS requires permits for importation or interstate shipment of all marine and freshwater snails. 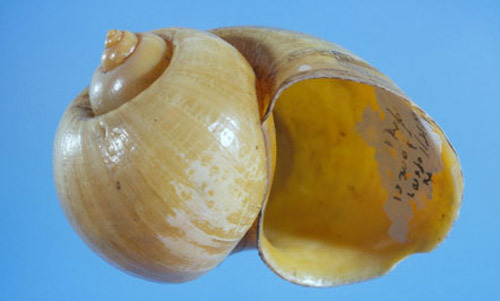 Permits are not being issued for members of the genus Pomacea, with the exception of the spike-topped applesnail, Pomacea diffusa (FFWCC 2006). To ship any of these species without a permit is a violation of U.S. federal law. Capinera JL, White J. (July 2011). Terrestrial snails affecting plants in Florida. Featured Creatures. (10 June 2013). (FFWCC) Florida Fish and Wildlife Conservation Commission. (2006). 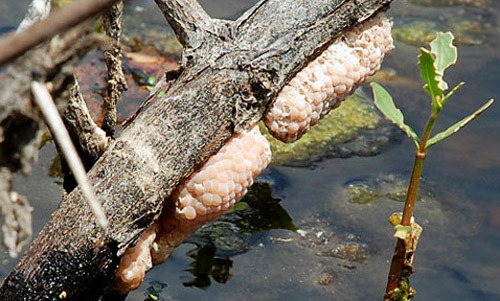 Non-native applesnails in Florida. (10 June 2013). Ghesquiere S. (2011). Apple snails. (10 June 2013). Jacksonville Shell Club. Pomacea paludosa (Say, 1829) Florida applesnail. (10 June 2013). Thompson FG. (2004). 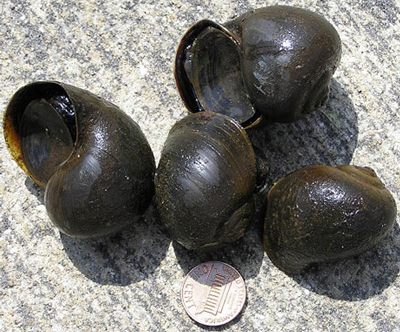 An Identification Manual for the Freshwater Snails of Florida. Florida Museum of Natural History. (10 June 2013). USGS. (April 2006). Pomacea paludosa (Say, 1829). Nonindigenous Aquatic Species. (10 June 2013). USGS. (August 2007). Pomacea haustrum (Reeve, 1858). Nonindigenous Aquatic Species. (10 June 2013). USGS. (August 2009a). Pomacea diffusa Blume, 1957. Nonindigenous Aquatic Species. (10 June 2013). USGS. (October 2009b). Pomacea insularum Blume, 1957. Nonindigenous Aquatic Species. (10 June 2013). USGS. (January 2010). Pomacea canaliculata (Lamarck, 1819). Nonindigenous Aquatic Species. (10 June 2013). Publication Date: March 2004. Latest revision: July 2011. Reviewed: December 2017.